It all starts the moment your alarm goes off and you open your eyes. When you wake up your body starts off very acidic and your metabolism is at its lowest. This is a normal process your body goes through while you are asleep and it is in repair and rest mode. What we do first thing in the morning sets a tone for our day, even what we eat and drink. Most of us wake up, have a cup of coffee, which is very acidic, and run out the door without even having breakfast. If this is a daily routine, it is not good for your body because it puts your body in a stress mode. 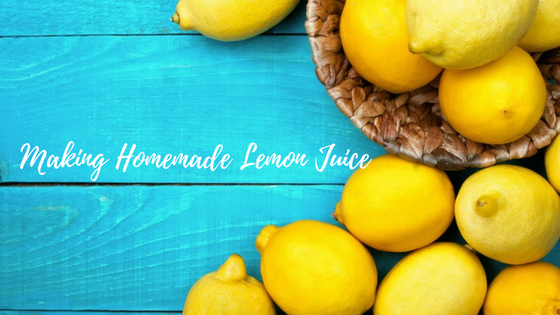 Now, I understand that you may not be ready to start your morning off with breakfast, so I have an easy Healthy Living addition to start your day, plus a fun make your own lemon juice tutorial video below. Let’s start with a fresh way to start your day. There are so many ways to start your morning off in a positive, healthy way, but not everyone is in love with mornings and I can definitely understand that. That is why I believe in doing simple things that are easy, won’t cause stress, or take up our precious time. My recommendation, and what I do, is to start your day with a big glass of water infused with a couple tablespoons of real lemon juice (not the processed concentrate, which has no health benefits). Drinking a glass of water with fresh lemon juice is a great way to start your morning. Here is why. Drinking lemon water will kick start your metabolism and level out the acidity in your body, especially when it is the first thing you give to your body. So, with one little baby action, right away you are starting your day off to help you stay healthy, manage your weight and feel energized. It helps with your digestion. It boosts your immunity, preventing you from illnesses. It aids in removing toxins from your body. It is a great source of citric acid, potassium, calcium, phosphorus, and magnesium – all essential minerals. Its high levels of vitamin C helps keep skin clear, slowing down the aging process, and helps cure the common cold. It helps with reducing pain and inflammation in your joints and knees. It helps balance the PH levels in your body. Now lets get to the good stuff and make some freshly squeezed lemon juice. Watch the video tutorial below if you are interested in prepping your lemon ahead of time. I am a big believer that if healthy food and drinks are ready and available in the fridge we are more likely to make it habitual in eating and drinking them because we don’t have to give it any thought. Cocktail recipe (because I’m a health coach, not a saint). Even Jesus drank wine. Fill a large glass with ice, add all of the ingredients, fill glass with San Pellegrino, stir and sip.